In late summer, when the herb garden is abundant, take clippings and collect seeds from mint, sage, savory, thyme, rosemary, parsley, lemon balm, fennel, and anything else you fancy. 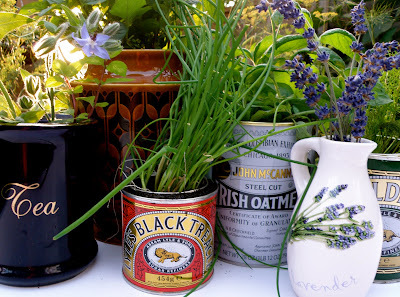 Pot them up in old kitchen canisters, attractive food tins and jars. If using canisters and jars, put small pebbles in the bottom to aid with drainage. If using tins, fit with a plastic pot. 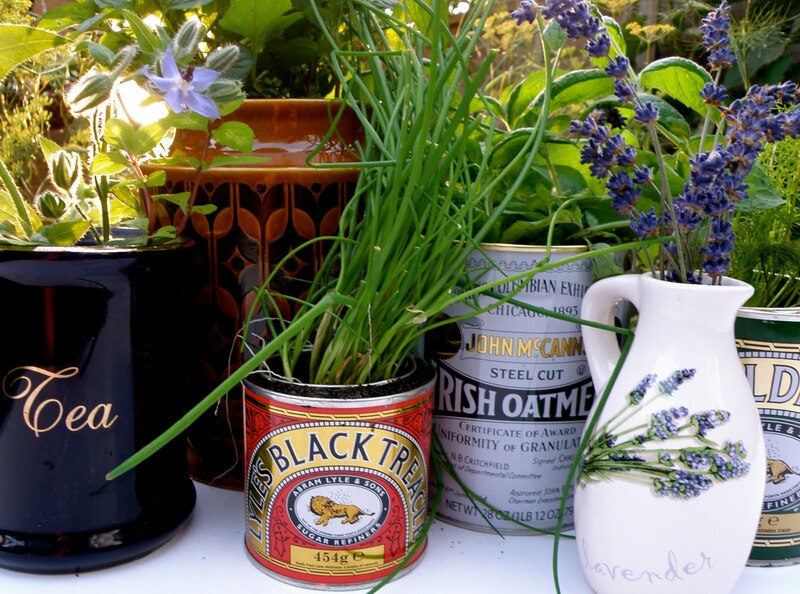 Tins will rust, but until they do, you'll get a lot of mileage out of them. Place plants in bright, sunny window, feed with organic fertilizer, and enjoy fresh herbs all year long. 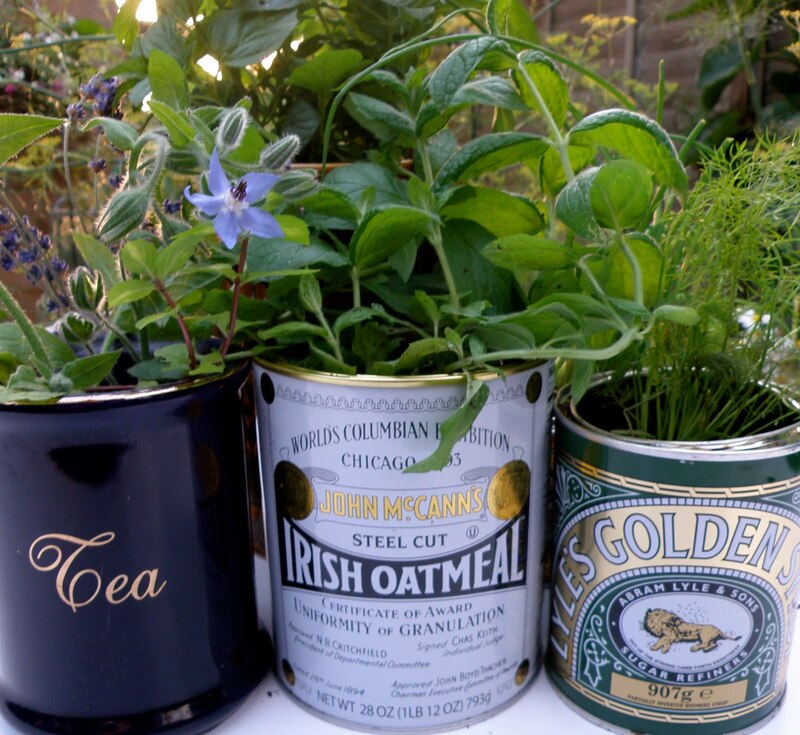 Depending on your choice of container, herbs make a fetching table decoration, or hostess gift, should we forget flowers. Not that we can ever forget flowers. Besides using them for herbs, I recycle containers like these to hold pens and pencils, clothes pegs, chop sticks, fondue forks, and all those kitcheny things that look good on an open shelf. Next time you pop into your local charity shop, keep an eye out for containers you fancy as pots, as well as for filling with staples. I picked up the blue tea canister, in mint condition for 95p. The miniature lavender jug was 50p. Not a scratch on 'em. 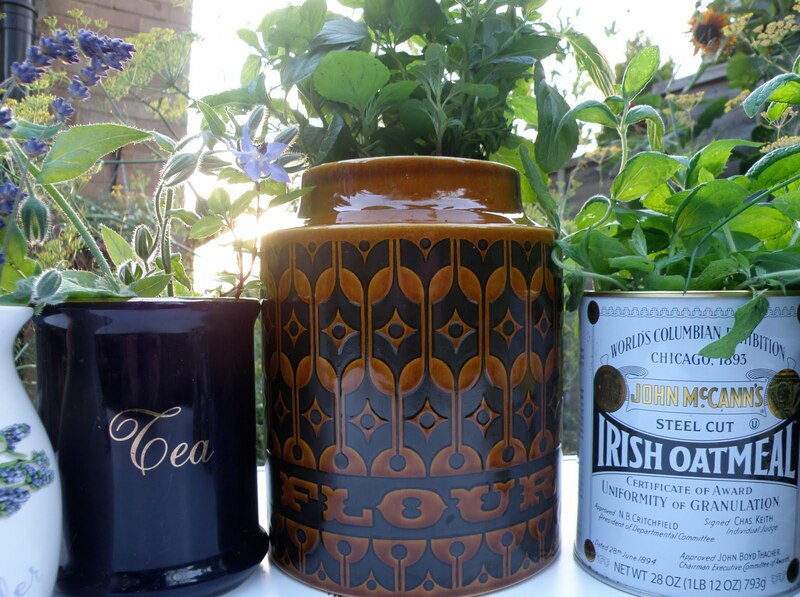 The old flour canister, on the left, belonged to Richard's mother. The lid was warped, but mint thrives in it. Come January, when fresh herbs are a near impossible luxury, a few freshly plucked leaves is all it takes to infuse a plate with optimism.